Rope Services Direct can supply you with 18×7 non-rotating stainless steel rope of various diameters, including this 12mm model that offers a load capacity of 7,568kg. 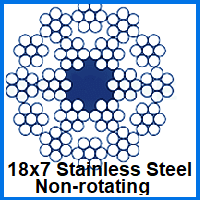 There are many other advantages to consider, so read on to discover the ins and outs of what 12mm 18×7 Non-Rotating Stainless Steel Wire Rope offers. For lifting duties and other tasks that need to be carried out in moist environments, stainless steel rope is really the only option. It shuns rust and is effectively capable of healing itself after the surface is compromised. Of course with an 18×7 construction, this non-rotating rope is less likely to suffer from abrasions, or leave its mark on other objects. This means that it will stay looking sleek and new for years, rather than becoming rough around the edges quite quickly. The 7.5 tonne capacity of this 12mm rope is also joined by a 74.2kN breaking force. Our engineers will test each rope before sending it out, so you can be sure it will live up to its claimed specifications. Any wire rope you order from RSD can be used to make an assembly of your choice. We use the latest manufacturing techniques and tools to get the job done and can also sell cutting machines, hand held swagers and other kit to customers that require them. Give RSD a ring on 01384 78004 or harness our email form to get your questions answered and your quotes supplied quickly. 12mm 18x7 Non-Rotating Stainless Steel Wire Rope Overall rating: 5 out of 5 based on 6 reviews.